These small parakeets make great companions with their cheery and chatty disposition. With the right attention and care, they can become quite tame, bringing a bundle of colourful joy to adults and children alike. Providing a cage large enough is important for all birds, so they can stretch their wings and exercise by flying from perch to perch. 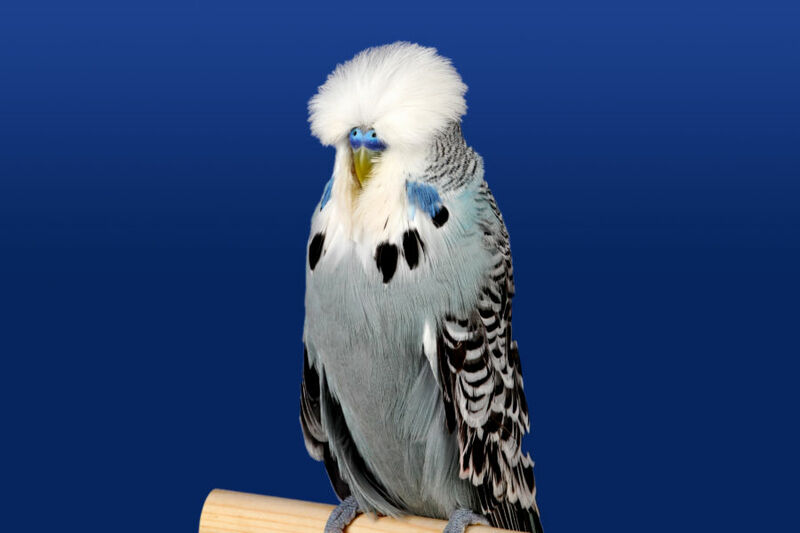 For a solo budgie, a 12” long, 18” wide and 18” high cage is required at minimum, but keeping more than one together will require a bigger space. Make sure your feathered friends have lots of time to fly freely outside their cage too, always under supervision and with doors and windows safely shut. Inside the cage or aviary, provide a variety of perches. Dry and untreated natural branches are best – the uneven surface is good for maintaining healthy nails and feet and the birds will enjoy stripping the bark with their beak, a natural behaviour in the wild. Budgies are active and love to play, so accessorising their home with toys such as mirrors, bells and rope ladders will keep them happy and stimulated. Rotating these toys regularly will add variety and extra interest. A ground covering of newspaper can be refreshed quickly and easily, as well as being kind to budgie’s feet. A fine layer of grit on top of this, which budgies will happily peck and scrape, will help with their digestion. Keep their cage safely away from drafts, direct sun and other pets. Their talkative character can mean that they might not be ideal office buddies, but avoid keeping them in the kitchen as cooking fumes can be harmful. Provide fresh water and feed daily, but be careful not to overindulge budgies as they can become overweight. As well as a good quality seed mix, you can treat them to small amounts of organic fruit and vegetables, offering extra nutrients and variation to their diet. Double check that the foods you give them are safe, as some, such as avocados, are surprisingly bad for birds. Happy, healthy budgies can live for up to 14 years. Maintaining good hygiene in your budgie’s home is essential for preventing disease and keeping them in tip-top condition. A daily sweep of the enclosure, a spot-clean and a wash and refill of food and water containers is an important practice, as is a regular, more thorough clean of the cage using warm water and a mild, bird-friendly soap. A shallow birdbath, kept clean and refreshed daily, enables budgies to bathe themselves, keeping their feathers healthy and their moods happy. Although relatively hardy for their size, keep an eye out for telltale signs of diseases, such as strange behavioural changes, runny eyes, or difficulties in breathing. Do not hesitate to seek professional advice if you have concerns.